Dr. Elif Guler, Assistant Professor and Coordinator of Longwood’s Professional Writing Program, recently facilitated a pedagogical workshop, presented a paper, and co-chaired a special interest group at the 2019 Conference on College Composition Communication (CCCC) which took place from March 13-16 in Pittsburgh, PA. Since 1949, CCCC has been the world’s largest professional organization for researching and teaching composition, from writing to new media. Dr. Guler facilitated a workshop entitled, “(Un)veiling Mediated Texts for an Intercultural/International Performance of Rhetoric,” which modeled the use of cross-national mediated texts (e.g., translated television debates and social movement sites), in order to expand students’ perception of non-Western cultures. The unit introduced an instructional unit which aimed to help students explore non-Western women’s dress styles (often stigmatized in Western contexts) and the surrounding discourses as rhetorical artifacts. The unit aims to hone students’ critical thinking skills through a cross-cultural understanding of rhetorical action. 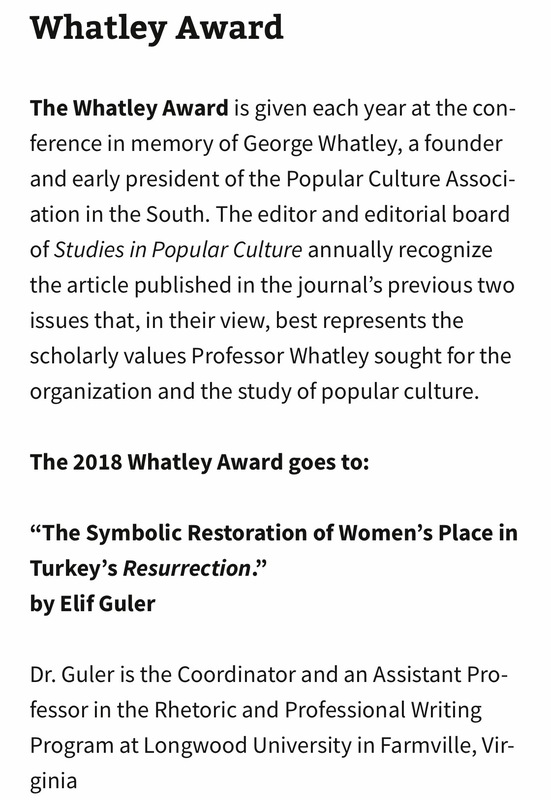 Dr. Guler’s paper entitled, “Recovering Turkish Principles of ‘How to Perform Rhetoric’ from Yusuf’s Wisdom of Royal Glory,” examined non-Western principles of rhetoric evident in the aforementioned text (1069) and how the text aims to educate an ideal agent who has to study language so s/he can effectively communicate with and utilize authority and power. By sharing the writing assignments developed for her rhetoric/writing courses at Longwood, Dr. Guler also discussed how Yusuf’s text can help contemporary writing students explore different national cultures and a moral understanding of rhetorical agency. 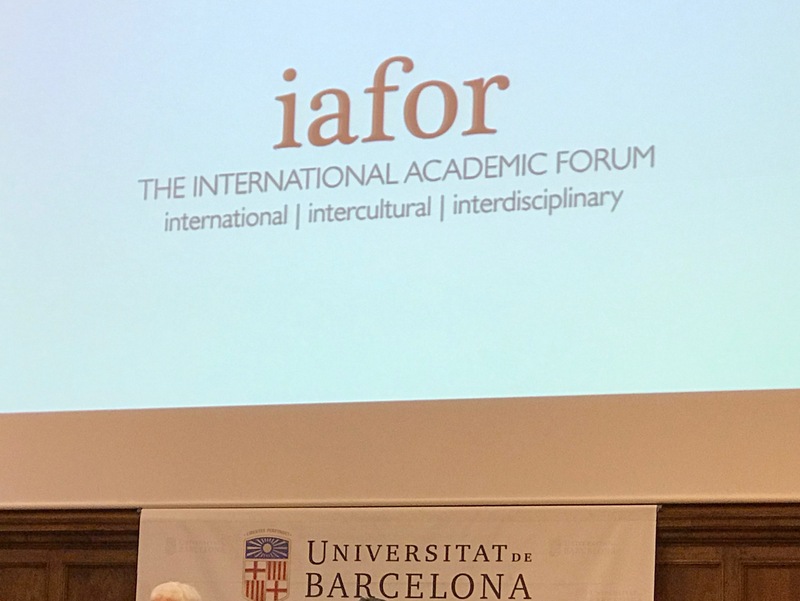 Dr. Guler presented her paper as part of a panel entitled, “Defying the Rhetorical Tradition: A Multinational Performance of Rhetoric-Composition,” which she organized with a diverse group of scholars focusing on Ethiopian, Indian, and Chinese rhetorical traditions. The panel was chaired by Cheryl Glenn, the 2019 CCCC Exemplar Awardee and Distinguished Professor of English (Writing and Rhetoric) at the Penn State University. Finally, Dr. Guler also co-chaired the Special Interest Group on Non-Western/Global Rhetorics – a standing group which seeks to increase rhetorical knowledge globally, to create new kinds of collaborations, and to welcome “Other” rhetorical traditions (Middle Eastern, Indian, Chinese, Asian, African, and indigenous American, and so on) to the disciplinary conversations at CCCC. 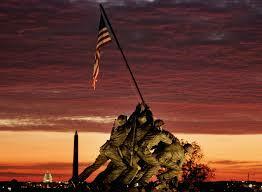 There are many ways to honor Veterans on Veteran’s Day, but one of the easiest may be simply listening to their stories. One church in Buckingham County has taken that a step further–with the help of Dr. Mike Lund, professor emeritus of English–and self-published the stories of the veterans in its congregation. WMRA’s Emily Richardson-Lorente went to meet a few of the contributors. Listen to the interview or read the transcript here. (Norfolk, VA) Lacy J. Klinger, Assistant Professor of Theatre, and senior BFA Theatre Performance Major Garrett D. Reese will be performing in the Virginia Theatre Association’s (www.vtasite.org) staged reading of the musical Bubble Boy. The musical is written by Cinco Paul and Ken Daurio (Despicable Me, The Lorax, The Secret Life of Pets), who also wrote the 2001 major motion picture of the same title and starring Jake Gyllenhaal. Klinger and Reese were chosen out of 100 video submissions from across the state of Virginia, which included a brief selection of a musical theatre song that showed off their vocal range and comedic acting technique. Klinger is playing the role of the title character’s germ-a-phobic, neurotic mother Mrs. Livingston. Reese will be playing the character of Slim, the leader of a biker gang, as well as serving in the ensemble. “Slim is very much a ‘tough guy’ with a very soft heart,” Reese says. “He’s been burned in the past but he refuses to live with regret, as we learn from his song, appropriately titled ‘Regret,’” Reese laughs. 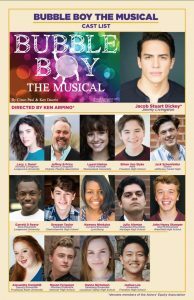 Jimmy Livingston, a boy destined to live his entire life in a plastic bubble lest he be killed by just one germ, will be played by professional Broadway actor Jacob Stuart Dickey (www.jacobstuartdickey.com) who is currently in the ensemble of Disney’s Aladdin on Broadway. Dickey also serves as the understudy for the roles of Aladdin and Kassim. This staged reading, performing on Friday October 26, 2018, is being produced in conjunction with the professional theatre company Wolfbane Productions (www.wolfbane.org), based in Appomattox, VA, and directed by Ken Arpino, the company’s Executive Director. The rest of the cast is comprised of high school students and theatre professionals throughout the state of Virginia, as well as VTA’s own president, Jeff Price. Congratulations to Mary Carroll-Hackett and Andrew Yeagley, the 2018 recipients of the Cook and Cole Medals for Undergraduate Mentorship. The John Randall Cook Faculty Mentor Award and the Waverly Manson Cole Faculty Mentor Award recognize, respectively, a tenure-track faculty member and a tenured faculty member who have demonstrated excellence in mentoring undergraduate scholarly activity and creative endeavors and working with students to disseminate the results through professional meetings, publications, exhibits or performance. These faculty members demonstrate a sustained record of such mentorships and impact on students’ careers as they move to graduate school or employment. 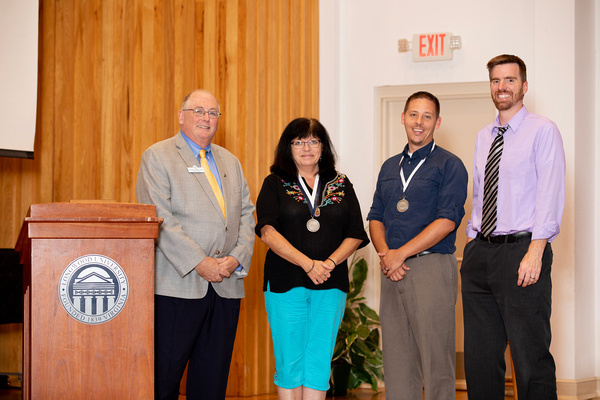 Mary and Andrew were recognized at the opening meeting of the Cook-Cole College on Wednesday, August 15. Pictured are Roger Byrne, Dean of the College; Mary Carroll-Hackett; Andrew Yeagley; and Adam Franssen, chair of the selection committee. 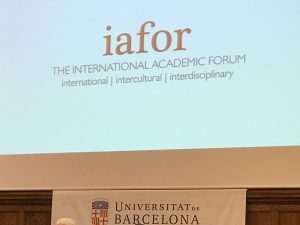 Dr. Elif Guler, Coordinator and Assistant Professor of Professional Writing at Longwood, has recently presented her study, “The Rhetorical Understanding of Agency in The Wisdom of Royal Glory and its Implications for the Contemporary World,” at IAFOR’s International Conference on Global Studies in Barcelona, Spain (July 2018). 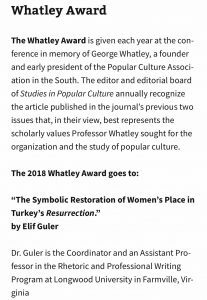 Upon invitation to the conference entitled, “Fearful Futures: Cultural Studies and the Question of Agency in the Twenty-First Century,” Dr. Guler was also asked to serve as a senior reviewer for IAFOR and invited to publish her study as a chapter in an intercultural rhetoric book contracted with the Southern Illinois University Press. Dr. Guler’s presentation covered some of the results of her studies recovering non-Western principles of rhetoric with a particular focus on the Turkish rhetorical tradition. Specifically, the presentation focused on an 11th-century Turkish text’s education of an ideal agent who has to study language so s/he can effectively and morally communicate with and utilize authority and power. Dr. Guler also discussed the implications of this text, which originated in the Karakhanid Empire of Central Asia, for a rhetorical construction of a collective identity–an identity which (rather than a race, an ethnicity, or being a lawful member of a society) relies on one’s act of following the tore (a certain set of moral principles that are supposed to govern an individual’s behavior). 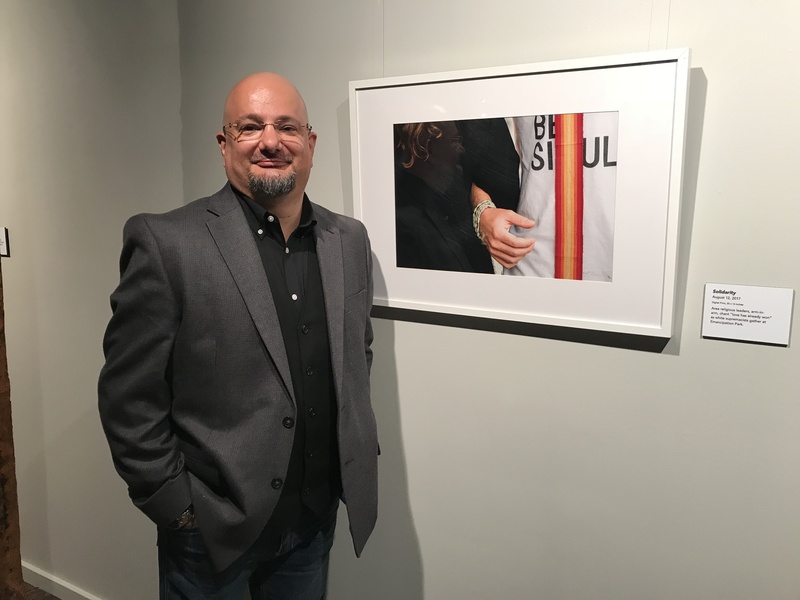 On Friday, August 3rd, Dr. Alec Hosterman’s photo documentary exhibit There’s Just Us opened at the Virginia Holocaust Museum in Richmond, VA. The exhibit documents his experiences at the 2017 Unite the Right rally held in Charlottesville, VA. The museum kicked off the exhibit on Thursday, August 2 with a special invitation artist’s talk given by Alec. 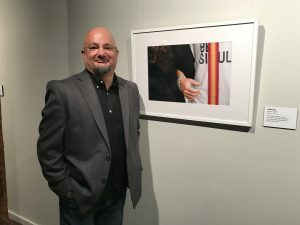 Alec was also interviewed by WCVE, Richmond’s local NPR affiliate, about his experiences in Charlottesville and the photos in the exhibit at the Virginia Holocaust Museum. Click here to read/listen to that interview. There’s Just Us runs from August 3, 2018 through October 28, 2018. Click here for more information on the exhibit and the Virginia Holocaust Museum. Chris Bjornsen presents results of current study of social media use and personality traits. Chris Bjornsen presented a poster at the May 2018 meeting of the Association for Psychological Science in San Francisco on the results of this year’s study of social media use and personality traits. The study examined the psychometric properties of revised measures of positive social media use, creeping, catfishing, and gossiping/shaming, and a new measure of social media pressure. These constructs were also compared to well-studied positive (‘Big Five’) and negative (‘Dark Tetrad’) personality traits. Females (ages 18-29) scored higher than males on all social media use measures except gossiping/shaming, and higher levels of social media use were predicted more consistently by higher levels of negative personality traits, especially Machiavellianism (the tendency to deceive and manipulate others for self-benefit). The presentation, available on ResearchGate, was coauthored by a Longwood University student (Madison P. Lowry) and colleagues from two separate U.S. universities.